Choose which career to ridicule first. 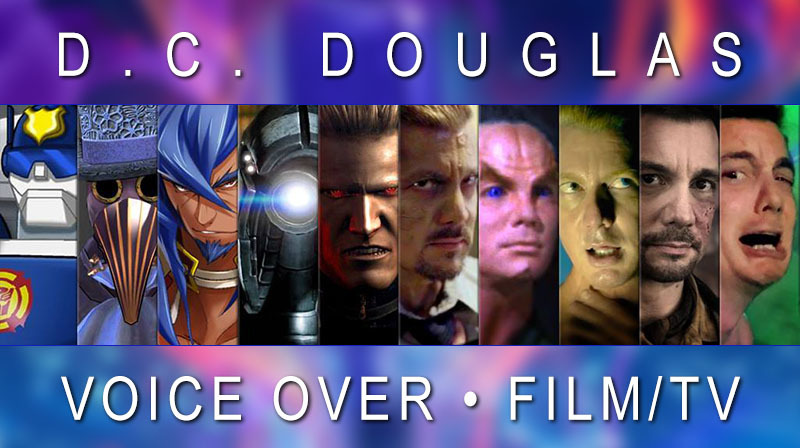 D.C. Douglas is a voiceover announcer and character actor based in Los Angeles, California. The following information is to help fans and potential clients find D.C. Douglas easier. Wow. That last sentence was so official. Okay, here we go: while this website is intended for both sides of my career, I am adding mainly VO related information on this home page so that potential clients who have never heard of me can find this site, fall in love with my voice and hire me. That way i can still be an on-camera actor in really low budget indie films that feed my inner artistic beast - like the kind of films you can see on the "Film & Television" side of my website right this very moment... If only you would stop reading this and scroll the hell up the page! I didn't start out wanting to be the "In a world..." voice. Far from it. I knew at the age of seven that I wanted to be a film and television actor after watching a "Hollywood and The Stars" special, narrated by Joseph Cotton. After that moment all I focused on was becoming an actor. I studied at local theatre companies (Like the Contra Costa County Civic Arts Repertory and CMTSJ - Children's Musical Theater of San Jose), took acting classes, and eventually made my way down to Los Angeles at age 19. One of the first acting schools/coaches I auditioned for was a lovely lady named Barbara Gill. The full story involves me not realizing what VO was nor what she did and just performing my monologue to her utter delight and confusion. Anyway, she said I had an amazing voice and should seriously consider voiceover as a second career. That was the beginning of it. (Side note: I eventually ended up studying at Estelle Harman's Actor's Workshop (Eden Bernardy.) A few years went by and I ended up signing with a non-union talent agency called L'Image Talent in Studio City. They sent me out on cheesy on-camera commercials. From there I stumbled upon King Productions. I went there to get my acting demo reel edited. They were using a new kind of process called non-linear editing with Avid. After watching the editor for 10 hours I realized I could do it better! I worked for a rich guy in Malibu at the time (Lloyd Eric Cotsen) and convinced him it could be a good side business. He bought the equipment and Planet Video was born. Meanwhile, that editor at King Productions knew that I did voiceover. So every now and then they would call me in to voice some movie trailer or promo. But even that faded with time. Through that same walla / ADR group I hooked up with Oak Tree productions (Andrew McCarthy) and began doing their trailers. I even did a few Asylum trailers early on after acting in one of David Latt and David Rimawi's first ever Asylum productions. Then the strike in the early century happened. I was financial core (ficore) so I decided now was my time to break into the world proper. I ended up auditioning for Elaine Craig, Kalmenson and Kalmenson, Carroll Casting and The Voicecaster. Once the strike was over, I had a much better voiceover demo reel and contacts / referrals. So I went off to land an agent. Enter Abrams Rubaloff and Lawrence. More specifically, Mark Quinn. I will forever credit my union voiceover career to him. When he moved over to Abrams Artists and Associates, I moved with him. I landed my daytime CBS promo gig through him. And even my GEICO gig was through him, though he left the agency before it turned into the hugely lucrative gig. As you can see, it was a long, long journey to here. And there is no right way to get here. Everyone has to find their own path and kick their own butts to do it. I have to say, though, working on Transformers: Rescue Bots with Peter Cullen, Steve Blum, Mark Hamill, Maurice LaMarche, Jason Marsden, Lacey Chabert, Jeff Bennett, LaVar Burton, Tim Curry and Ginny McSwain has been the most educational experience of my life. And recurring on Cartoon Networks Regular Show has only broadened my mind with animation and cartoons. Film, television and Videogame credits includes Transformers: Rescue Bots, Chase, The Haunted Hathaways, KILD TV, Resident Evil: Revelations 2, Albert Wesker, Mass Effect 2 and 3 as Legion the Geth, Isle of the dead with Joey Lawrence and Maryse Mizanin, Final Fantasy XV, One Piece, BlazBlue: Chronophantasma Extend as Azrael, Lost Dimension - George Jackman, Narutoas Gari, The Young and the Restless, Sharknado 2, NCIS, Days of Our Live, Apocalypse Kiss, Alpha House, Helen Alone, The Crew, BlazBlue: Chronophantasma as Azrael, NBA2K14, Kickin It!, Rune Factory IV, The Bucks of The Tecomate, The Last of Us, Z Nation, Sharknado 2, Dog with a Blog, NCIS: Los Angeles, 2 Broke Girls, Hot in Cleveland, Castle, Workaholics, Sullivan & Son, Franklin & Bash, Star Wars: The Old Republic, Mass Effect 3 as Legion, Bucket and Skinner Epic Adventures, Tales of Graces f, Street Fighter X Tekken, Raising Hope, Family Guy, Dragon Age II, Marvel vs. Capcom 3: Fate of Two Worlds, Titanic , Mass Effect 2, Criminal Minds, Nier Replicant, Family Guy, Resident Evil: The Darkside Chronicles, Resident Evil: Umbrella Corps, Tekken 6 as Raven, The Bold and the Beautiful, Ultimate Weapon, Resident Evil 5 as Albert Wesker, The Crooked Eye, Tales of Vesperia, Without a Trace, Resident Evil: The Umbrella Chronicles, Eternal Sonata, The Suite Life of Zack and Cody, NYPD Blue, Star Trek: Enterprise as Zepht, Buffy the Vampire Slayer, Charmed, Beverly Hills, 90210, Diagnosis Murder, Boston Common, Under Siege 2: Dark Territory, Melrose Place and many more. My Voiceover Service covers radio and television commercials, narrations, explainer videos, voicemail greetings, IVR, DRTV, promos and trailers. Voiceover rates, rate card, union or non-union, financial core information are found in the VO Service page. Did you really just read all of that? You're insane. Stop. Forget everything you just read. Scroll back up and click on one of the damn buttons! Enjoy the videos. Read the blog. Then share my website link with all whom you love. Big hug. Los Angeles Voiceover Actor Service © 2002 - Present Douglas Media Inc.